On March 19, 1928, Prohibition Agent Joseph Allen Purvis was driving his Government vehicle in Seattle, WA, when a truck attempting to make a u-turn, suddenly swerved in front of him. Agent Purvis was unable to stop and crashed into the truck. Agent Purvis suffered serious injuries from the impact with the steering wheel and flying glass. He was rushed to the local hospital, and died nine days later. 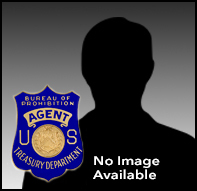 Agent Purvis joined the Prohibition Unit on June 1, 1925, and was assigned to the Seattle Field Office.